Preschool - ages 2 1/2 to 4 - An engaging and fun Introduction to movement using movement, music, storytelling and props. Morning class available. Combo Classes - ages 4 to 5 - An introduction to ballet, tap and jazz styles that infuses vocabulary, technique in a fun and educational method. Ballet I - ages 6 and up - Introduces and focuses on ballet technique, vocabulary, barre and center work, stretching, leaps & turns and small combinations. 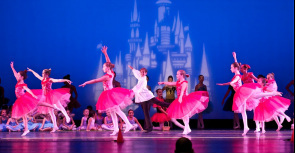 Ballet II - ages 8 and up plus teacher recommendation. A continuation of Ballet I with more of a concentration on jumps and port de bras. Ballet III - Teacher recommendation - a continuation of Ballet II developing intricate combinations with beats, turns and port de bras with an emphasis on body placement and strength flexibility and musicality. Tap I - ages 6 and up - Introduction to tap steps, technique and vocabulary. 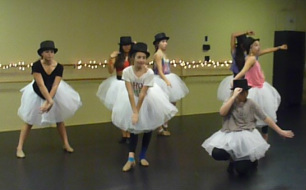 Tap II - ages 8 and up - A continuation of Tap I with an emphasis on combinations, rhythm, technique and vocabulary. Tap III - A continuation of Tap II with advanced combinations, rhythmical concepts, vocabulary and technique. Tap IV - a continuation of Tap III with emphasis on speed, turns intricate patterns choreography and technique. The Modern Class is for all levels and is a contemporary class often based on exploring movements with lots of emphasis on the dynamics of movement. Students will be moving on many different levels exploring floor work, and partner work as well as focusing on tempo and creating new choreography. Dance Teams - ages 8 and up - by audition only - Representing a multitude of dance styles, our award winning dance teams have an emphasis on performance, competitions, workshops, conventions and master classes. Intensives - We partner with a wide range of professional performer/teachers from likes of Broadway, The Joffery School, "So You Think You Can Dance" and more. 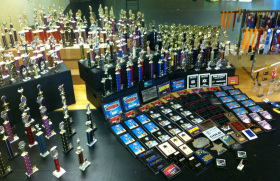 This provides our students with a real-world perspective and access to these truly amazing dancers. Click here for the next event in our Master Class Series. Adult Class - A fun filled class that's focusing on movement and stretch. No prior experience needed. The class changes from week to week with lots fun music. All levels are encouraged to join! Kids Hip Hop - ages 4 to 6 - Focuses on large motor skills do develop coordination and balance in small kids. Advanced Kids (Tween) Hip Hop - ages 7 to 11 - Fun energetic class that increases body placement incorporating floor work and stretch as an introduction to the hip hop style of dance. 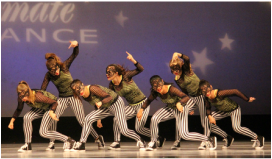 Beginner Hip Hop - ages 10 and up - A faster paced class developing multiple combinations increased floor work and strength and commercial dance styles. Intermediate Hip Hop - ages 11 and up - A continuation of beginner hip hop with and emphasis on complex choreography and steps. Advanced Hip Hop - Instructor approval - A continuation of intermediate Hip Hop with an emphasis on musicality, improv and intricate choreography. Musical Theater I - An introduction to jazz dance with an emphasis on Broadway, theater terminology, singing, choreography and the use of props. Musical Theater Advanced - A continuation of Musical Theater I with an in depth look at Broadway theater and styles focusing on original Broadway choreography and technique. 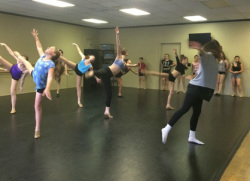 Pointe - invitation only - Advanced ballet skills focusing on body placement, foot work with special emphasis on developing technique and vocabulary. 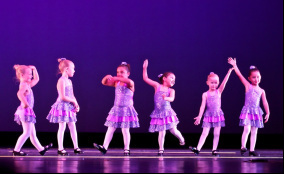 Lyrical I - ages 5 to 7 - A beginning class that focuses on technique, stretch and expressive movement utilizing leaps, turns and floor work. Modeled after ballet, it is more free flowing. Lyrical II - ages 8 and up - A continuation of Lyrical I with an increased focus on body placement, intricate floor work and technique. 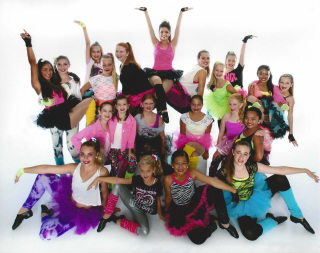 Lyrical III - ages 12 and up - A continuation of Lyrical II with advanced combinations, intricate patterns and improv. Tumbling Beginning - ages 5 and up - Focusing on strength stretch and begging skills to include headstands, handstands, cartwheels and back-bends. Tumbling Intermediate - instructor approval - A continuation of beginning level with increased focus on one handed cartwheels, back and front walk overs, strength and conditioning. Tumbling Advanced - instructor approval - A continuation of intermediate level with increased focus on body strength and skills including back handsprings, tucks, aerials and advanced conditioning. Jazz I - ages 6 and up - A fun technique filled introduction class focusing on leaps, turns, isolations and floor work in the commercial style. Jazz II - ages 7 and up - A continuation of Jazz I with more advanced skills and combination with an increased focus on technique. Jazz III - instructor approval - A continuation of Jazz II with more intricate patterns, floor work, multiple turns, isolation and changes in feet and weight. Jazz IV - instructor approval - A continuation of Jazz III this is a fast paced class with additional focus on technique, floor work and combinations. Private coaching - Coaching is available to enhance and increase skills. Please call to schedule a session.